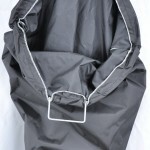 Made of black pack cloth, with mesh at the very bottom only makes this a low snag bag. This bag comes in two sizes, Large 18×30 and Medium 11×26. This is the ideal bolstering or artifact recover bag.